Cleanliness is about detoxing, embracing organic, all-natural methods and products, and protecting the environment. 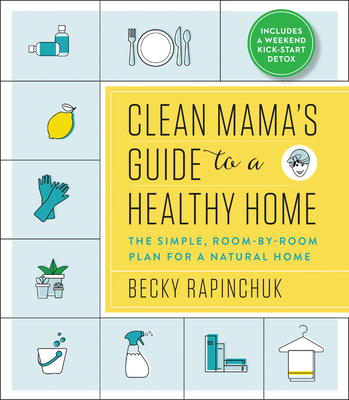 Moms look to Becky to guide them in the best cleaning practices for their home, and will welcome Clean Mama’s Guide to a Healthy Home, which shows that going natural isn’t just a better way to a cleaner home—it’s vital to the health of our bodies, our families, and our planet. BECKY RAPINCHUK is the founder of Clean Mama, the most popular cleaning website in with world. The Clean Mama empire spans several highly successful businesses, including a membership-only monthly subscription, an organic cleaning line, a paper goods company, and an online community. Rapinchuk is the homecare expert for Scotch-Brite and has also worked with a variety of brands as an ambassador or brand affiliate, including Dyson, Home Depot, SC Johnson, Martha Stewart, Bissell, Casabella, Murchison-Hume, The Laundress, Aprilaire, and Neato Robotics. Rapinchuk is an online columnist for Better Homes & Gardens, the housekeeping expert on Answers.com, and a regular home expert for Real Simple, the New York Times, Bon Appetit, Better Homes & Gardens, HGTV Magazine, InStyle, Shape, Oprah.com, Houzz, Refinery29, and others.